Celebrate 15 years of mini-figures, with Marvel Minimates Series 75! Series 75 focuses on the street-level world of the Defender. 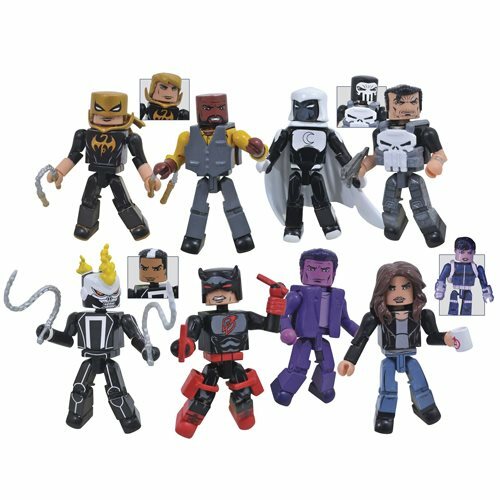 The team's costumes highlight this assortment, which pairs Luke Cage with Iron Fist, Daredevil with Ghost Rider (the first Robbie Reyes Minimate! ), Punisher with Moon Knight, and Jessica Jones with the Purple Man (his first comic-style Minimate!). Plus, this series features the first-ever Minimates build-a-figure! Collect all four sets to build a full-sized Minimate of S.H.I.E.L.D. agent Daisy Johnson, a.k.a. Quake! Each 2-inch mini-figure features 14 points of articulation and fully interchangeable parts, and each two-pack comes in a full-color window box.